As you picture the first fish to crawl out of primordial waters onto land, it's easy to imagine how its paired fins eventually evolved into the arms and legs of modern-day vertebrates, including humans. But a new study by researchers from the University of Chicago and the Andalusian Center for Development Biology in Spain shows how these creatures used an even more primitive genetic blueprint to develop their proto-limbs: the single dorsal, or back, fin common to all jawed fish. "The unpaired dorsal fin is the first one you see in the fossil record," said Neil Shubin, PhD, the Robert R. Bensley Distinguished Service Professor of Anatomy at UChicago and co-author of the new study. "Here we show that the genetic mechanisms that pattern all the fins and other paired appendages originally arose there and were redeployed to others." In mice, a genetic enhancer or on/off switch called ZRS controls the expression of Shh limbs. If you knock out ZRS in a mouse, its limbs won't develop properly. The researchers used CRISPR/Cas9 gene editing tools to knock out ZRS in the medaka, a small, popular aquarium fish also known as a Japanese rice fish. They expected that deleting ZRS in the medaka would affect its paired fins, but instead the fish didn't grow its unpaired dorsal fin. The paired pelvic and pectoral fins developed normally. That led the team to look for other genetic enhancers that might be involved, and they found a related "shadow enhancer" nearby called sZRS that seems to work in conjunction with the main ZRS switch. When they knocked out both ZRS and sZRS in the medaka, both its dorsal fin and paired fins were lost. That means it's likely that ZRS was first used help develop dorsal fins, then later copied and reused as sZRS when paired fins first appeared about 475 million years ago. "It's very ancient, and the sequence and function are conserved across all vertebrates," Shubin said. "It turns out the primitive role for the ZRS was involved with the dorsal fin. It's only later that its activity in the paired fins required this other shadow enhancer." Shubin said understanding the activity of these enhancers helps identify the traces of evolutionary ancestors present in all vertebrates, from Tiktaalik roseae, the 375-million-year-old transitional "fishapod" species he discovered in 2004, to modern-day humans. "A number of human maladies are based on mistakes in the ZRS that can lead extra or missing fingers, or changes in the shape of hands," he said. 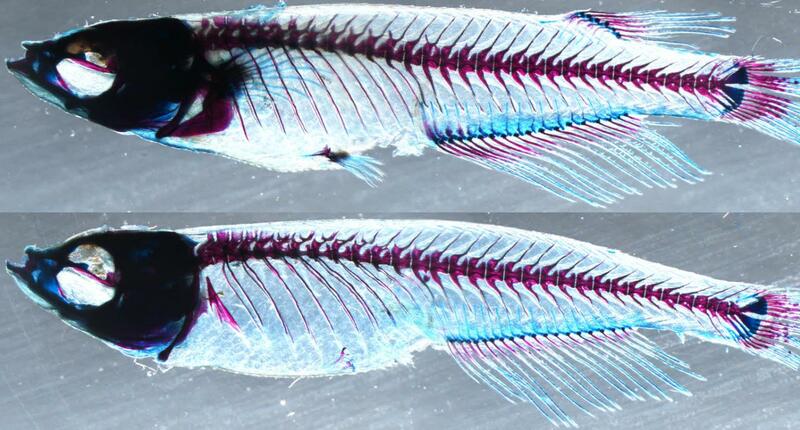 "Humans probably have this shadow enhancer too, so if we want to study the dynamics of how this affects limb patterning, what we see in these fish models is a great place to start." The study, "cis-regulatory logic of Shh expression reveals common history of unpaired and paired fins," was supported by the Spanish Ministerio de Economía y Competitividad, the Andalusian Government, the European Research Council and the CAPES/Alexander von Humboldt Foundation fellowship. Additional authors include Joaquín Letelier, Elisa de la Calle-Mustienes, Silvia Naranjo, Ignacio Maeso and Juan Ramón Martinez Morales from the Andalusian Center for Development Biology, Spain; Joyce Pieretti and Tetsuya Nakamura from UChicago; Juan Pascual-Anaya from Evolutionary Morphology Laboratory, RIKEN, Japan; and Igor Schneider from Universidade Federal do Pará, Brazil.